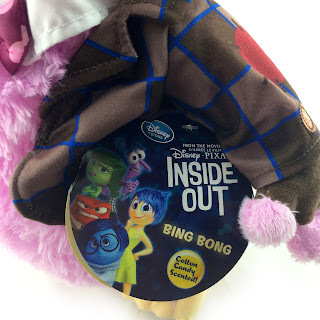 Here we have the new Inside Out Bing Bong plush toy sold now exclusively at the Disney Store! 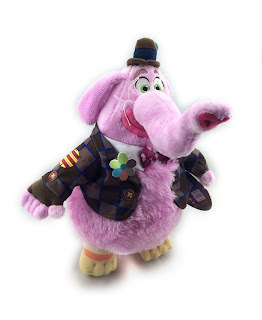 In the film, Bing Bong (voiced by Richard Kind) is Riley's imaginary friend who is made of cotton candy and is "part cat, part elephant, part dolphin." What's so cool about this 16" plush is that he actually smells exactly like cotton candy. Literally, if I was blind folded and had to differentiate between real cotton candy and Bing Bong's scent, I probably wouldn't be able to smell the difference. 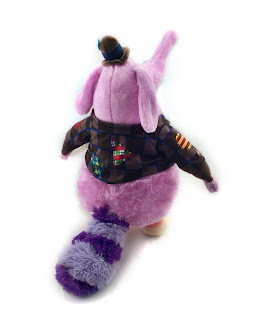 Between the fantastic cotton candy smell, fantastic design, detailed embroidered features and his, extremely soft, fluffy "fur", this has to be one of the coolest Disney Store plushes that have been released. Is it weird I smell him probably once daily? Actually- don't answer that. Bing Bong is a delightful character that audiences will love. For me, he was one of the highlights of the film. Definitely don't miss out on this one! You can purchase him in Disney Stores or on their online site HERE. He retails for $19.95.